There is a heated rivalry brewing between the Rangers and the Blue Jackets, and the disdain for each other was on full display tonight. Despite improbable circumstances, the Rangers score three goals in a span of 77 seconds to propel them over the Blue Jackets, spoiling their home opener and heading back to Madison Square Garden after a 4-2 win and with a 2-0 record. For large stretches of the night, Columbus was the aggressor, energized by their home fans and looking to make an impact in the first game of the season. But the Rangers weathered the storm, played an excellent defensive game, and grinded out another road win. The victory also gave Alain Vigneault his 100th win as the head coach of the Rangers, becoming the 10th head coach to win 100 regular season games with the Rangers. He was the fastest to reach that total out of the 10. These two teams clearly don’t like each other, and that was evident from the get-go. The physicality was through the roof, with the Blue Jackets playing with an edge. They were energized and looking to smack the Rangers around. They did to some extent, but the Rangers made sure to play with some physicality themselves. After some back and forth action, the Rangers were the first team to find the back of the net, thanks to a strong forecheck. Mats Zuccarello forced a Columbus defender into a turnover along the boards, and Dominic Moore won possession of the puck. Zuccs went right to the front of the net, and backhanded the pass from Moore past Bobrovsky, sending the Rangers into the locker room with a 1-0 lead. Mats Zuccarello scored his first two goals of the season in Columbus. Photo courtesy of MSG Photos. After trying to smack the Rangers through the boards, the Blue Jackets toned things down a bit, continuing to hit but focusing more on creating offensive chances, evident by their 14 shots in the period. They would score the only goal of this period, with Brandon Dubinsky sending a great pass up the ice to Cam Atkinson, who dekedpast Lundqvist and tied the game at one. The game would open up with about five minutes to go in the period, with both Henrik Lundqvist and Sergei Bobrovsky making some great saves and poke checks to keep the game even. Lundqvist had 22 saves through the first two frames. Before the period began, assistant coach Ulf Samuelsson talked about how the Rangers needed to get the puck from out of their own zone quicker, and not get pinned back in their own zone. They worked on that, and improved their play in the period. Things continued to stay chippy, with both captains going after each other at one point. With 4:02 remaining in the third, Ryan McDonagh was whistled for delay of game, and gave the Blue Jackets their fifth power play of the night. Columbus would take their first lead of the game thanks to newcomer Brandon Saad, rifling a wrist shot past a screened Lundqvist. Both teams were playing a very physical style of game. Photo courtesy of Getty Images. Things looked bleak, with New York facing a 2-1 deficit with just 3:50 seconds remaining on the clock. But the character of the Rangers cannot be doubted, and they showed resilience in the late stages of the game. The first goal came off of a Jackets mistake when defender Kevin Connauton tried to pass the puck up the middle of the ice. JT Miller blocked the pass and found the puck first, making an excellent pass off the boards to Oscar Lindberg. Lindberg made no mistake, slotting it through the legs of Bobrovsky and evening the score at two goals apiece. 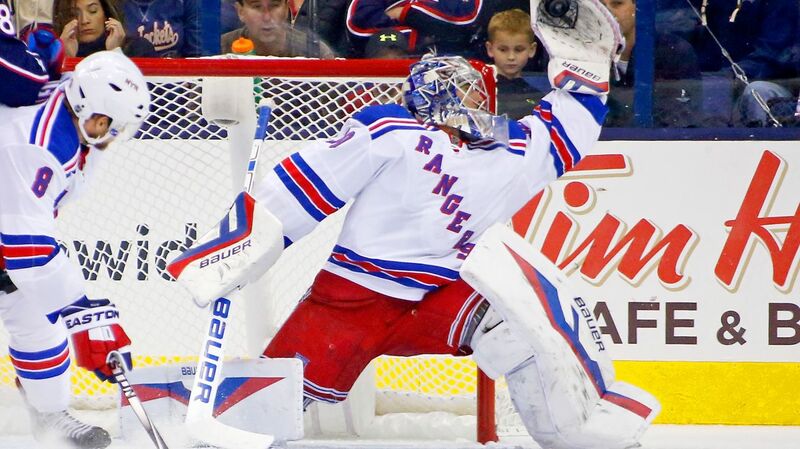 Just 17 seconds later, the Rangers would score again when Kevin Hayes fired a bad angle shot, almost parallel to the goal line, surprising Bobrovsky and slipping through his pads giving the Rangers a 3-2 lead with 2:19 to go. Mats Zuccarello would seal the victory with his second goal of the game just a minute later, collecting a loose puck and snapping it past Bobrovsky. Perhaps it’s too early to talk about character building wins, but this has to be considered as one. Like many times under Vigneault, the Rangers battled against adversity to come away with a win at any cost. It’s an excellent confidence booster heading into the home opener. Alain Vigneault wanted Lundqvist to get off to a good start, and play as many games as possible early on, and now it makes a lot of sense why. Lundqvist is locked in and playing like a man possessed. His 31 save performance tonight gives him a GAA of 2.00 through two games, and he has stopped 63 of the 67 shots that he’s seen. He’ll get the nod tomorrow night as well in Madison Square Garden. Oscar Lindberg continues to prove why he belongs in the NHL. Tonight wasn’t all about his offense, even though he wound up scoring the game tying goal. Lindberg made some excellent defensive plays in this game, both at even strength and on the penalty kill. Vigneault has put him on the ice in crucial situations, and both goals have been extremely important. Again, JT Miller was noticeable on the ice, generating chances with his vision. His pass to Lindberg was a great hockey decision, and his third assist of the season. He plays well with Lindberg, and the third line has been playing very well. 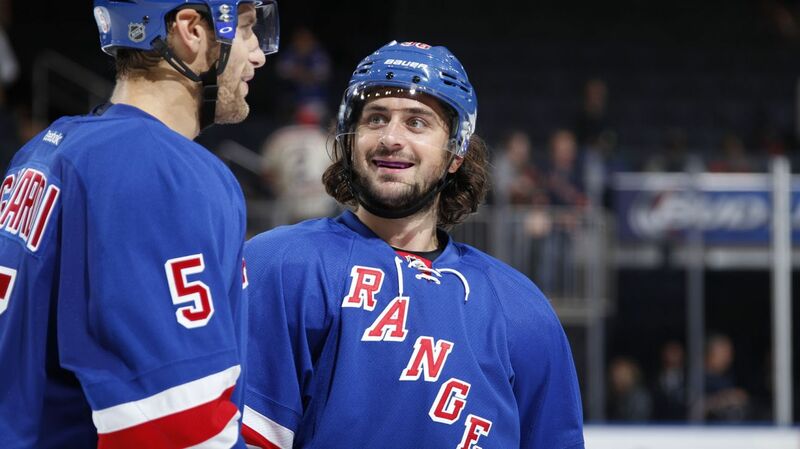 It was great to see Mats Zuccarello back on the scoresheet and making an impact. Both of his goals were excellent, finishing on two prime scoring chances and placing his shots perfectly. The Rangers needed more from their top line, and they got it from Zuccs. Tonight was the night that I saw Ryan McDonagh fully embody the role of captain. Through all three periods, he was rallying the troops, trying to jumpstart his team both offensively and defensively. McDonagh was clearing the crease, playing physical, and he was also on the ice for all four goals and none against. Excellent game from the second year captain. The Rangers will look to carry the momentum into their home opener on Saturday night against Columbus. 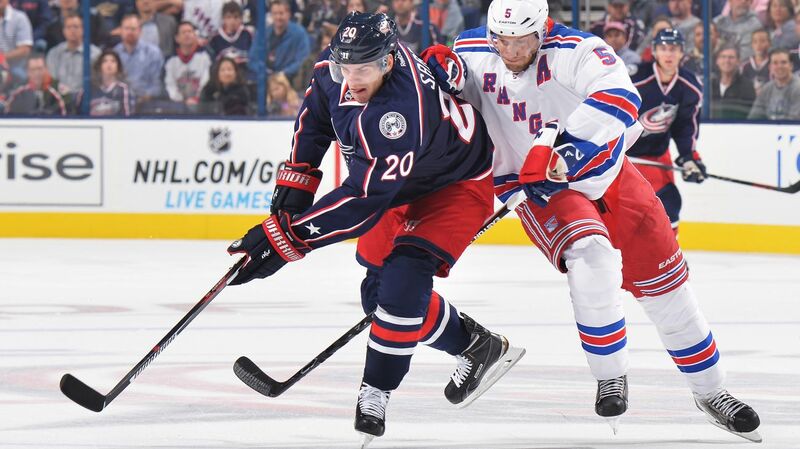 Posted on October 10, 2015, in Game Recaps and tagged Alain Vigneault, Brandon Saad, Chris Kreider, Columbus Blue Jackets, Dan Boyle, Dan Girardi, Derek Stepan, Derick Brassard, Dominic Moore, Dylan McIlrath, Emerson Etem, Jarret Stoll, Jesper Fast, JT Miller, Keith Yandle, Kevin Hayes, Kevin Klein, Madison Square Garden, Marc Staal, Mats Zuccarello, MSG, New York Rangers, New York Rangers blog, New York Rangers roster, NHL, Nick Foligno, NYR, Oscar Lindberg, Rangers, Rangers blog, Rangers Season Opener, Rick Nash, Ryan McDonagh, Viktor Stalberg. Bookmark the permalink. Leave a comment.